The candidates debated the issues as the students listened to the arguments at Guardian Angel School in Oran on September 26. Democratic candidates were Camryn Lynch, Vice-President & Cooper Priggel, President. Republican candidates were Traci Hency, President & Katie Webb, Vice-President. Libertarian candidates were Jordan Diebold, Vice-President & Lydia Tankersley, President. Since it is a presidential election year, Ms. Ann Whistler decided it would be a good idea to teach her American History students at Guardian Angel School, Oran, all about the election process. Students ran for the offices of House of Representatives, Senate, and President/Vice-President. They ran on the party tickets of Republicans, Democrats & Libertarians. 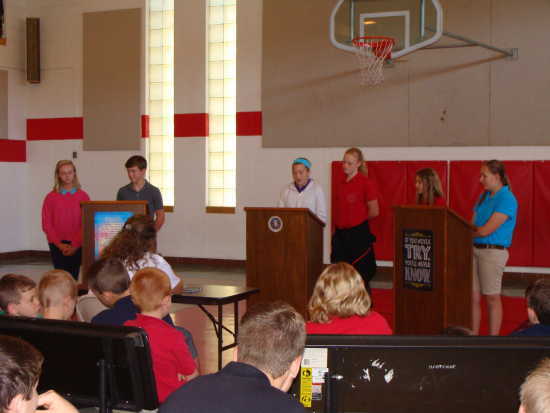 A primary was held on Wednesday, August 31, with the students in grades 5-8, faculty and staff voting. Absentee voting ballots were given to anyone whom was going to be out that day. The winners of the primary made campaign signs and lined the school walls with them. Some of the contestants handed out literature, asking for votes. A debate was held between the candidates on Monday, September 26. Voter registration cards were filled out by everyone and had to be presented at the voting polls, in order to vote at the elections on Tuesday, September 27. 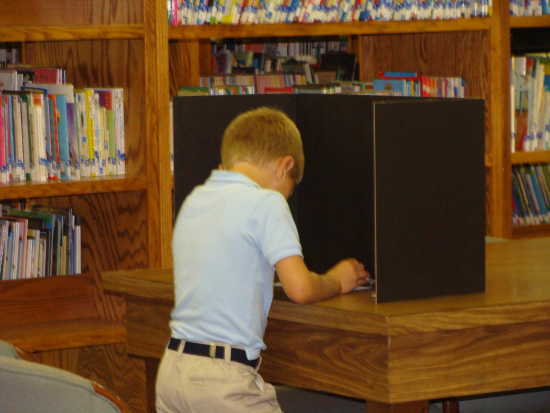 Grades K-8, faculty and staff were all able to vote at this election. Absentee ballots were given out again for those who could not be there on Tuesday. Results were compiled by both the electoral vote and the popular vote, to show how the two ways could produce different winners. However, it was a very close race and the same winner was produced. With 25 electoral votes possible, the winners were the Republicans with 12 electoral votes: Traci Hency-President; Katie Webb-Vice President; Dalaini Bryant-MO House of Representatives; & Riley Schlosser-Mo Senate. With 70 total popular votes, the Republicans received 29 votes, the Democrats, 26, and the Libertarians, 15. Over the past few weeks, the students learned many things about how the voting process is ran and how much work is put into running for a public office. 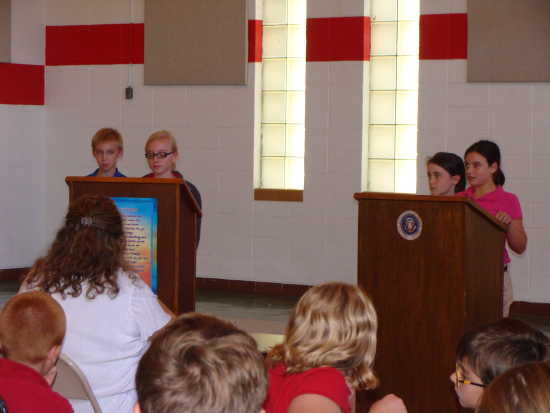 Debates were held for the candidates for Missouri Senate at Guardian Angel School in Oran on September 26. Pictured are Republicans Drew Pobst, Campaign manager, & Riley Schlosser, Missouri Senate and Democrats Connor Watkins, Missouri Senate, & Nathaniel Woods, Campaign Manager. 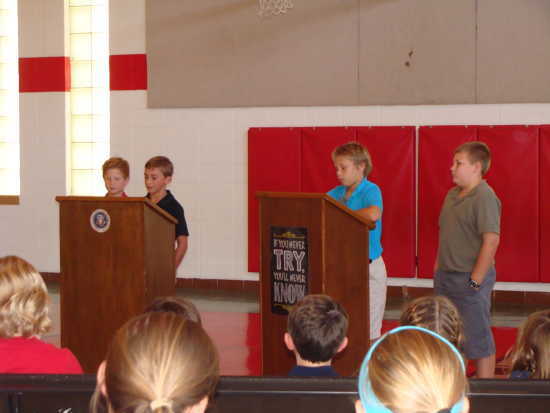 Debates were held for the candidates for Missouri House of Representatives at Guardian Angel School in Oran on September 26. Pictured are Democrats Kyle Eftink, Campaign Manager, & Logan Dame, Mo. House and Republicans Taylor Hobbs, Campaign Manager, & Dalaini Bryant, Mo. House. Voting day at Guardian Angel School in Oran was September 27. Kaitlyn Jolley, Langdon Scheeter and Brittany Dirnberger check the voters registration cards and take in the ballots from Kasyn Seabaugh and Rylie Priggel. Jonah Dirnberger votes at the polling booth at Guardian Angel School in Oran on September 27.